Why focus on grand challenges? Universities across the U.S. and beyond are answering the call to action raised by the National Academy of Engineering (NAE) in partnership with the National Science Foundation. That call has focused public attention on the NAE Grand Challenges, a critical grouping of problems that must be addressed and solved in order to maintain our national security, quality of life and sustainable future. Addressing issues this complex requires innovation and cooperation from engineers of all kinds, as well as policymakers, economists, geologists, biologists and sociologists. The 2010 Grand Challenge Summit Series sustained dialogue and helped to foster engagement with grand challenge problems as a way to improve the way we educate our students. The grand challenges are a focal point to direct efforts to better prepare students at all levels for the challenges ahead. 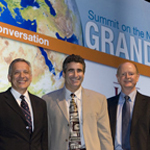 In 2013, the first Global Grand Challenges Summit will be held in London, England. If you're interested in becoming a corporate sponsor, contact Russell Holloway. If you are interested in future summits, please contact Minnie Glymph. As of 2012, twelve universities have launched NAE Grand Challenge Scholars programs. This Scholars program is a combined curricular and extra-curricular endeavor designed to prepare college students to be the generation that solves the grand challenges facing society in this century. Learn more. Duke University, the University of Southern California Viterbi School of Engineering and the Olin College of Engineering hosted the inaugural Summit on the NAE Grand Challenges in March 2009. In 2010, the team was joined by other key universities who hosted summit events in Phoenix, Boston, Seattle and Chicago, followed by a culminating national event held in Los Angeles in October 2010. The first Global Grand Challenges Summit--an initiative of the national academies of engineering in the US, UK, and China--was held in London in March 2013.